There are so many things I love about the fall and Halloween. One of the things that I love the most are the flavors, and one flavor that I am particularly fond of is candy corn. I could eat candy corn all day, and now there are so many different candy corn flavors out there. Being the die hard candy corn fan I am I hadn’t tried any of the new flavors until I was asked to create some recipes using candy corn. I didn’t have to think twice about that one! 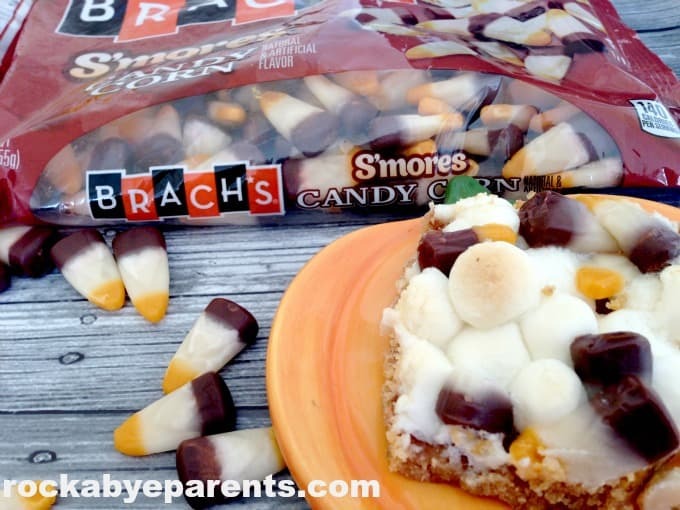 One of the types of candy corn that I was sent to use was Brach’s S’mores Candy Corn. I was very impressed that it actually tasted like both a s’more and candy corn. Not an easy thing to do! 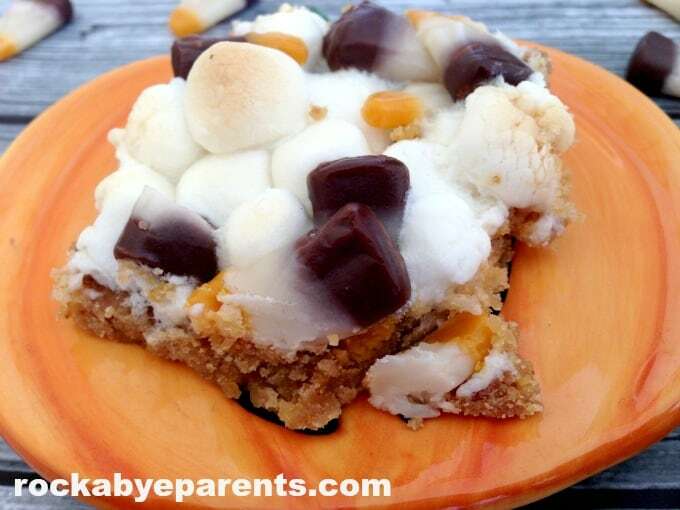 It didn’t take long for me to decide that the best thing to make with these would be S’mores Candy Corn Bars! This recipe was inspired by a recipe that my mother had for S’mores bars and I was really happy with how my adaptation of it turned out. I don’t think I should admit how fast I ate these things up though. Oh my gosh, they were so good! I simply couldn’t get enough of them. My mother and grandmother got a chance to try the S’mores Candy Corn Bars out as well and they both liked them. These were an all around hit! This recipe is really easy to make and it takes almost no time. I was pretty surprised actually by just how fast it went together. 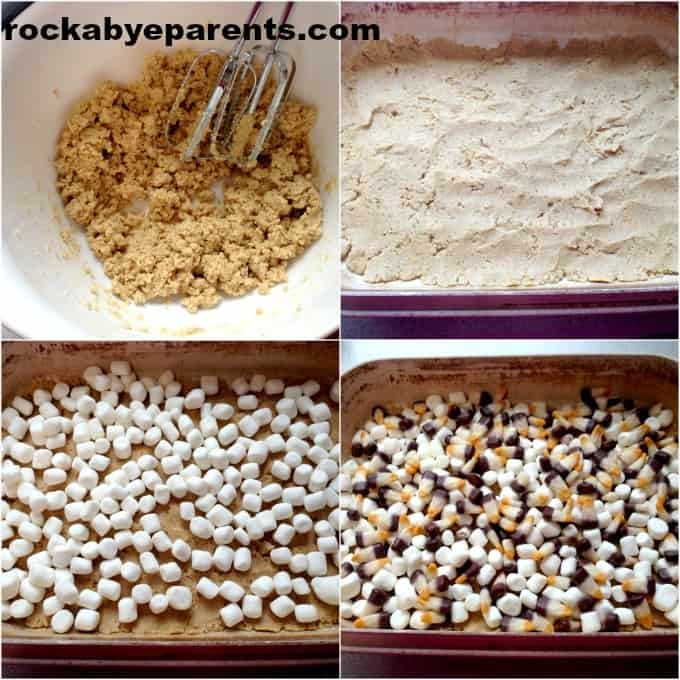 Beat a few ingredients, pack down the graham cracker crumb base, put two ingredients on top, and throw it in the oven to bake. Plus they only take 15 to 20 minutes to bake. This is the perfect Halloween dessert to make when you’re short on time, or when you have lots of time! First you need to beat the butter and brown sugar together until the mixture is light and fluffy. Then add combined flour and graham cracker crumbs and mix it all together. Next press the mixture onto the bottom of a greased 9-inch square pan. I don’t own a 9-inch square pan, so you’ll notice in the pictures that I used a 12.5 x 9-inch rectangular pan. The crumb bottom was thinner than it would be in the square pan, but I still felt it was thick enough, so no worries if you don’t have a 9-inch square pan. 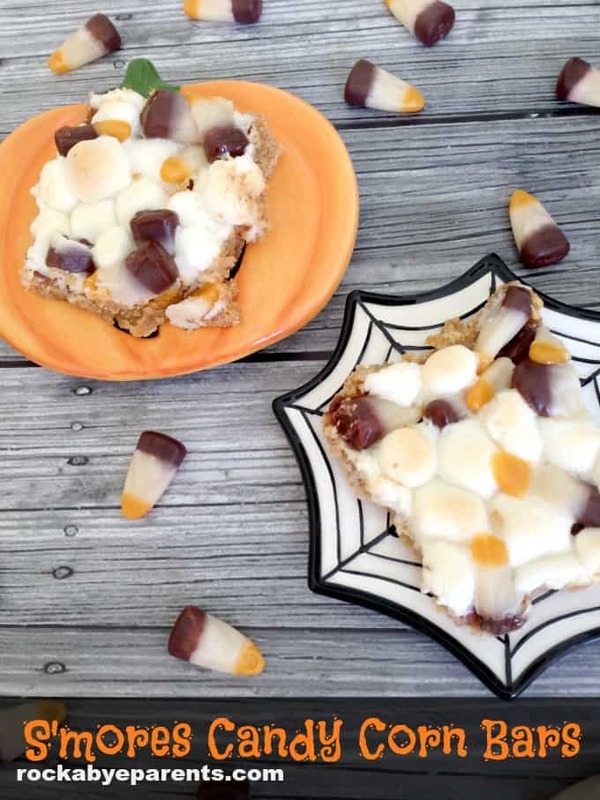 Once the crumb mixture has been pressed firmly down sprinkle the marshmallows and then the Brach’s S’mores Candy Corn on top. Then put the bars in the oven to bake at 375 for 15 to 20 minutes or until golden brown. Allow to cool and then cut into bars. How interesting! I really think this recipe is cute. Thanks for sharing it with us. This looks like a yummy dessert. I didn’t know they had S ‘more flavored candy corns. I didn’t either until I had received it! It was soooo good too!